The Navajo keyboard is no doubt a vital tool if we are going to use the Navajo language. This is especially important if we want more language resources to become available online. Now, I am not referring to the Navajo font. This happens because the author is using numbers 1-10 and a few other keys to make the appropriate markings on the vowels. The text can be read correctly only if the reader has properly installed the font. 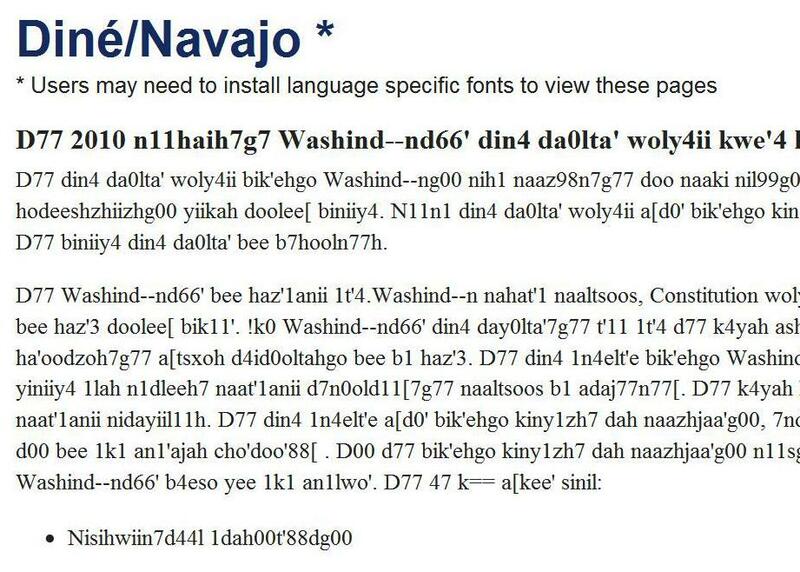 Installing the Navajo font is easy. It can be downloaded here along with the installation instructions. From my experience, the font can be used in programs like Microsoft Word and Excel. 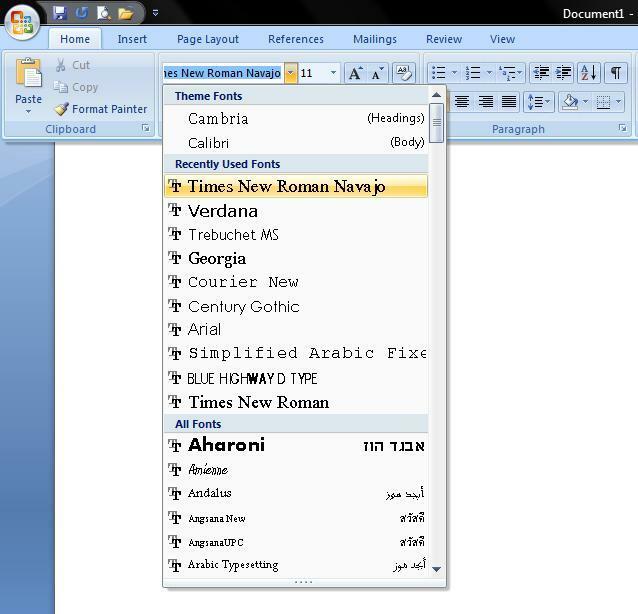 The font can be used correctly if the writer is able to select the Navajo font instead of Arial or Veranda, for example, to be used in the document. The major disadvantage to using the font is that the text is illegible to an audience who does not have the font already installed on their computer. The font is not difficult to install, however this is a problem if the audience is viewing the text from a computer to which they have no administrative privileges to install the font. Also, perhaps your audience is not familiar with how to properly install fonts; people are sometimes apprehensive about fiddling around with things on their computer for fear of altering an important file or folder. I believe there are more advantages to using the keyboard instead of the font. It can be downloaded for Windows and Mac computers here along with the installation instructions and the keyboard layout. For revitalization purposes, the Navajo keyboard should be used. It is more versatile. Using the keyboard is also easier to use than the Navajo font. It is similar to using other international keyboards, where a few keys function as triggers to make any of the vowels carry an accent or the little squiggly beneath the vowel. Using the keyboard to produce a document will not require the audience to have any previous font or keyboard installment. They just simply have to read. No more jumbled mess of numbers, characters and letters. Note: I have come across an occasional “i” that looks funny when viewed on different computers. I think this has to do with varying computer software and the internet browser of choice. One more thing, when our intention is to type Navajo text somewhere on the internet this could sometimes become tricky. If there is no settings option to change the font… things might look a little funny. The best thing to do is to first test out the default font with the same series of letters that I have typed in the photo above on the site you are anticipating using the Navajo keyboard. I’ve posted a font test on my Facebook Wall that you could use for your test. The Facebook test looks alright, so should you desire to type in Navajo on your Facebook wall, it should look fine. I use the keyboard 100% of the time now. 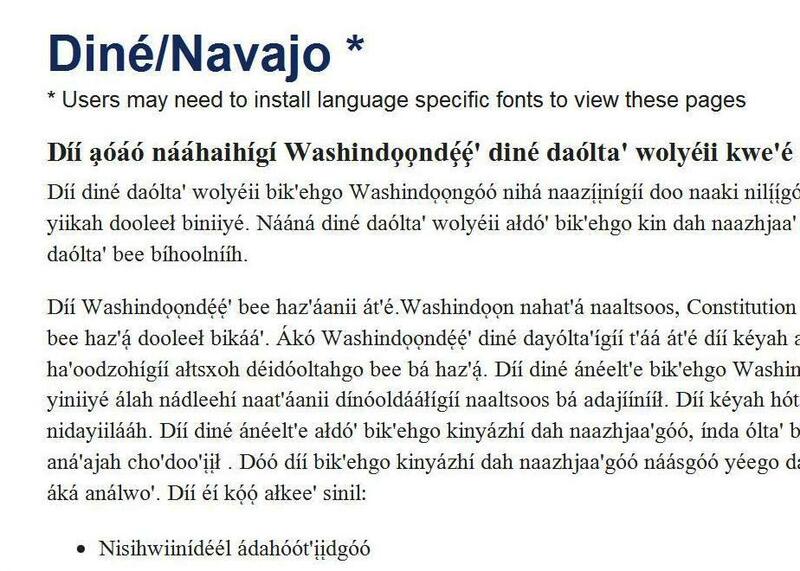 I wish I could say that you only have to download the Navajo keyboard and not the font, however there are still websites that utilized the font. Downloading the font is inevitable if you want access to the information on sites like GoMySon.com and Lapahie.com/Dine_Bizaad. But you don’t have to use the font to type anything else. Stick with the keyboard to type, download the font to read older webpages. Hey Krystle, you forgot about the smart phone’s ability to do some Navajo text. Smart phones use ASCII to display them. Nasal tone abilities are not present in regular ASCII here is a list of availible characters using a smart phone or coding in ASCII. Yeah I remember the ALT method, I used to watch my coworkers use it at a Hispanic non-profit I worked for. It was so much easier to switch the keyboard settings. My boss didn’t want to believe that she could change it and never let me show her. ALT takes so much time. I thought about adding the smartphone text. I thought maybe I could write another post, if I found a way to include the nasal marks. I have still yet to find a way. But thank you for the comment to make everyone aware. Thank you for the info. Very informative. Saved me a lot of research time. Ahéhéé’! I did everything what you wrote and now I can type it on facebook. thanks! ’Ahéhéé’ bee shíká’íínílwod. But theirs one thing though? my friends on fb didn’t see the diacritical marks on their screen. just words…so why is that? my screen have the diacritical marks on the words. Hmm, I found some differences when looking at the same text from different computers running on different operating systems. They should be able to see it if you used the Navajo keyboard. I just stumbled upon what could be the problem. In some web browser you can sometimes set what your default font will be for every site you view. In Foxfire I found it defaulted to what the websites wanted in their own coding. But that can be customized. So it might be that your friend has set the browser font permanently to a specific one. It can be checked in the browser settings. I’m trying to download the keyboard to my MacAir that as the OS X Mountain Lion. I can’t find the account library folder with the keyboard layouts…would you know how else I could find the keyboard layouts? I’m not familiar with OS X Mountain Lion, I will put your question up on the FB wall. Someone there should be able to answer the question. We are wondering if this App works on iMacs and and not just phones and iPads. Hi. Hope you can help me please I am trying to spell the word…Judy or Jude or Judith in Navajo letters can you help.